Our cold, gray Utah winter has left me longing for color and spring flowers. So I started looking through the photos I took last year and selected a few to use to create some water color paintings. I painted away on 10 x 10 pieces of 300 lb watercolor paper. I wasn’t completely happy with the results so I took a chance and tried something I have never done before. I pulled out my pastel paints (that I hadn’t used in 20 years) and added a layer of pastel to my watercolor paintings. I loved the effect of the pastel on the rough watercolor paper surface! I thought I had invented a new idea, but I have since learned many pastel artists do a watercolor under painting then add layers of pastel. I did quite a few paintings, but these three are my favorite and now hang framed in my kitchen. Flower Basket Bike from a photo I took during the 2012 Hidden Garden Tour held in June in Utah County. NYC Flower Market from a photo I took on trip to New York with my daughter. We loved walking the streets of the flower district. I love succulents that look like flowers. This succulent painting was inspired by the succulent photos my daughter takes. You can see her photos on her website: Succulents and Sunshine. So nice to hear from you Sharon! I’m always happy to find a fellow flower lover and artist. Hope you create something beautiful with your paint and brushes. Beautiful floral works! 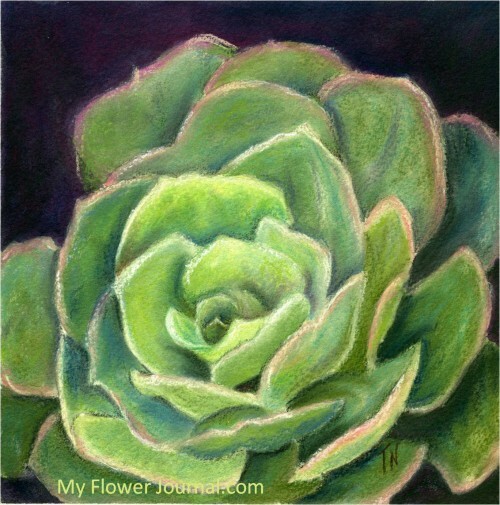 I especially love the repetition and variety of shapes in the succulent painting. Well done! Ahh…we all need a comfy couch like this! Lovely floral paintings! I especially love the succulent with its repetition of shapes in a variety of sizes! Well done! oh my-these are beautiful!! 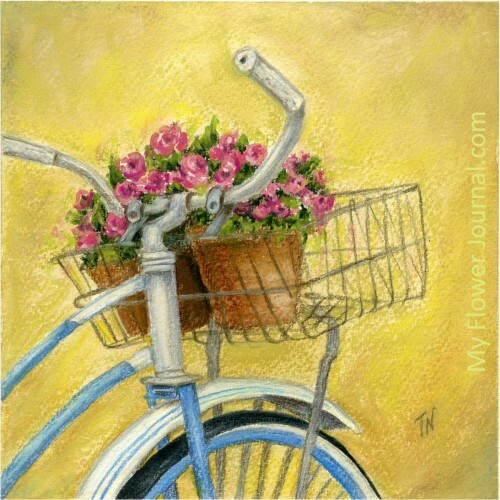 I especially love the bicycle one with the basket of flowers! Happy PPF! I just enjoyed reading all your blogs and looking at the pictures. 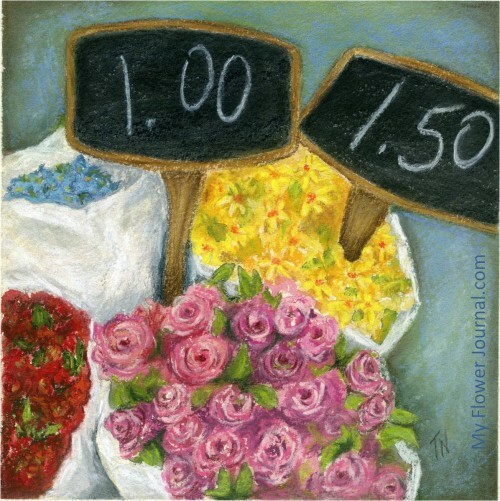 I love the three paintings from the Jan. blog. I love the succlent picture. It really does have the shape of a flower. I love the organic look you have to it.